Consulting on Network Design and Communications Infrastructure Needs. Voice, data, phone, coax, and fiber optic cabling. MDF/IDF data room build out, including equipment racks, patch panels, patch cables, termination units – everything you need for a complete voice and data communications system. Network hardware requirements including servers, switches, routers, hubs, storage devices, virtualization, and more, configured and installed to your specifications based on site survey, organization’s needs, budget and operations analysis. 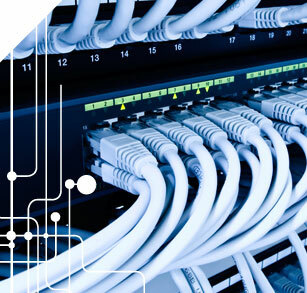 Whether you need a LAN or WAN, we’ll select the proper devices you need as well as connection resources for your bandwidth, QoS, security and application requirements. Testing and certification. RSI, Inc. will test your newly deployed network and verify connectivity, load balancing, and accessibility.